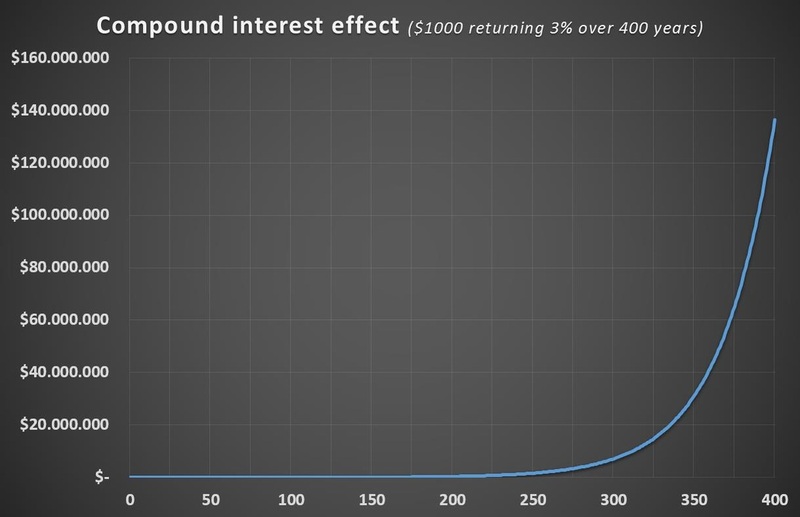 There are still a lot of people who are not aware of the compound interest effect. But even if they are, it is still hard to really understand how it works over the long-run. The following chart displays this effect on an initial investment of $1000 returning 3% annually over 400 years. Many people might have experienced an insurance sales agent who challenged one by mentioning the importance of an early planning of one's pension. Even though this agent might annoy at this moment, his warning is absolutely correct. Assuming that in all following examples the objective of Maxi is to achieve an additional $1000 monthly pension at the age of 67. How much does she have to save per month to achieve that goal? A real return of 3% annually is assumed, which means 3% above inflation. 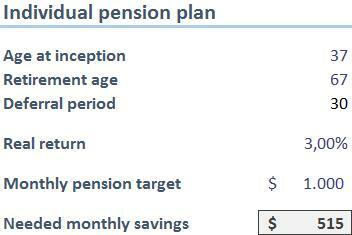 Maxi starts at the age 37 to save for her own pension. Maxi starts at the age of 27 to save for her own pension. 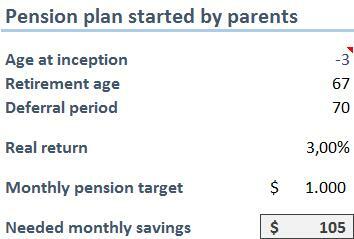 Maxi's parents start to save for her pension 3 years before she is born. 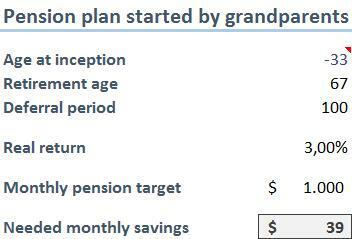 Maxi's grandparents start to save for her pension 33 years before she is born. The importance of the compound interest effect in pension planning should not be underestimated. Indeed, it is so important that it should be the main aspect to focus on. Having missed ten years of saving between the age of 27 and 37 will lead to $515 monthly savings instead of $324 in order to achieve an extra $1000 pension at the age of 67. If Maxi's parents would have started this saving plan 3 years before she was born, Maxi would just have to take over a $100 saving plan to achieve her goal. She could be really happy if her grandparents would have started this plan 33 years before she was born. 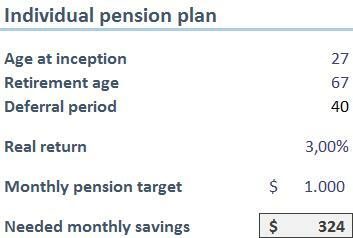 In this case, she would only have to take over a $39 saving plan to achieve her additional $1000 pension.